This gluten-free, vegetarian pasta salad is a nutritious and colorful accompaniment to any potluck, BBQ, or weeknight meal. I added chopped herbs and lemon juice to keep it light and fresh, but it's also hearty and satisfying thanks to the lentil pasta, garbanzo beans, and sun-dried tomatoes. We enjoyed liberal bowls of this pasta salad for dinner, repurposing it for leftovers during the week. It's quick and easy, and it's already a staple in our household. While it's been too hot in Denver to eat a warm, creamy bowl of pasta for dinner, this chilled, flavorful salad has recently curbed my pasta craving. I simply threw together a few ingredients I had on hand, guessed the ratios, crossed my fingers, then plated our dinner. Luckily, it received my husband's stamp of approval and I loved it too. There are plenty of pasta salad dishes on the web, but I used lentil pasta (low-glycemic and high in protein and fiber) mixed with heart-healthy olive oil, zesty lemon juice, chopped basil, smoky sun-dried tomatoes, fresh goat cheese, and a few other nutrient-dense veggies. You can make this vegan by omitting the cheese (or using a vegan substitute)! If you don't like sun-dried tomatoes, use something else. The beauty of this salad is that it's very versatile. The flavors meld together perfectly, plating summertime in under 20 minutes. I hope you enjoy it! 1. Cook your pasta according to the package's instructions (mine took 5-6 minutes). 2. Add your arugula, rinsed garbanzo beans, chopped artichokes, sliced cucumbers, julienned carrots, basil, and sun-dried tomatoes to a large mixing bowl. 3. Make your dressing: in a small bowl, add your olive oil, dijon mustard, lemon juice, apple cider vinegar, minced garlic, thinly sliced shallot, and capers. Whisk. Add more olive oil if you'd like. 4. Add your cooled pasta to the salad base. Evenly mix all ingredients together. 5. 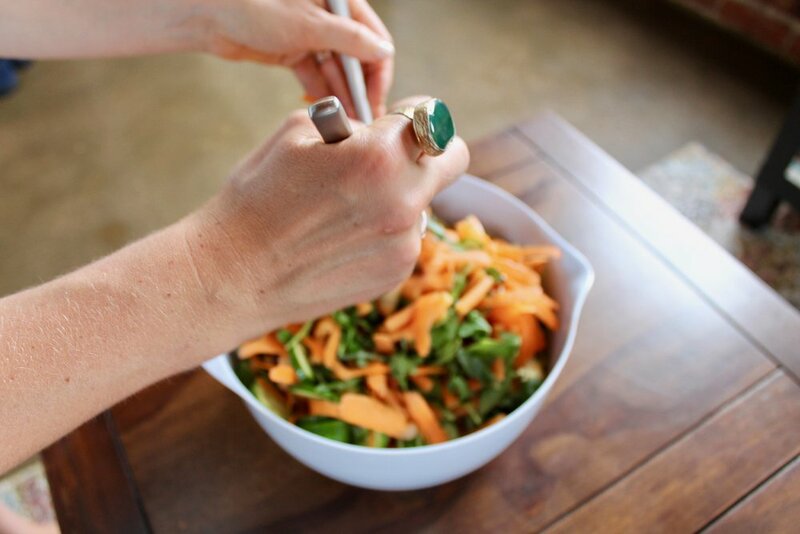 Pour your homemade dressing into the large mixing bowl and evenly coat your veggies and pasta. Sprinkle your goat cheese on top and serve.